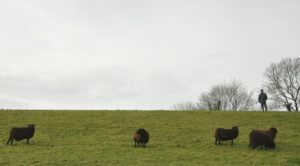 On December 10th 2011 I visited Cyril Cromie and his flock. 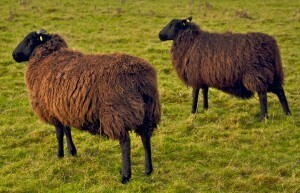 He had been cross breeding a Zwartbles ram with Scottish Blackface ewes. I wanted to see the resulting 2011 lambs and photograph them to share with other breeders. These are the Scottish Blackface ewes which he crossed with the Zwartbles ram. 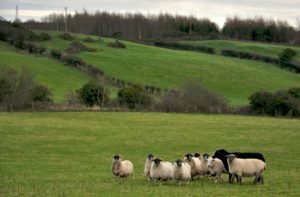 He will be retaining the ewe lambs for his commercial flock. 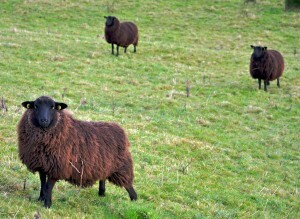 As you can see there are 2 other sheep of different breeds mixed in but most are the Scottish Blackface. These are a few of the Zwartbles X Scottish Blackface ewe lambs that he retained for his commercial flock. Cyril believes these ewe lambs make an ideal cross. As hoggets they will probably be put in lamb to a Charollais or a Rouge ram. I hope to get back to Cyril Cromie and photograph these resulting lambs and see and hear how they do.